Cauliflower Breadsticks So Good, You Won't Miss the Flour! 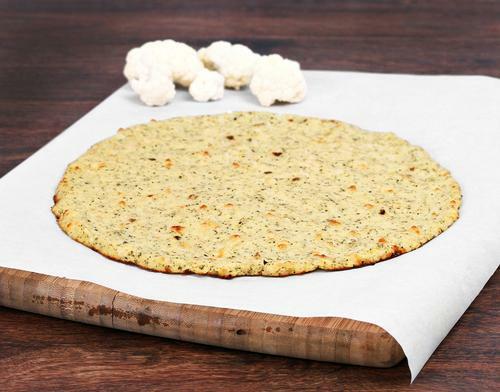 Using cauliflower as a bread substitute is a great low-carb and gluten-free idea. These cauliflower breadsticks are so delicious and packed thanks to the nutrient packed cauliflower. 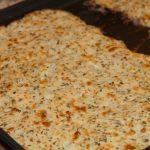 Cauliflower Breadsticks, Pizza Dough and More! These healthified cauliflower breadsticks are so flavor packed you’ll forget they have zero flour. You can use this recipe to make pizza crust or garlic knots, too! Working with cauliflower as a bread substitute can be tricky. After steaming your cauliflower, you have to really ring out as much water from the cauliflower as much as you can. That way it’s not soggy. The best way I’ve found is to take a kitchen towel and ring it out 2-3 times, making sure you get as much water out as possible. You may have to add more cauliflower depending on how big you want your pizza. Just make sure to roll it out thinly so it cooks evenly and crisps up. Bake it once for about 15 minutes then remove from the oven but leave it on. Add your sauce and toppings and bake once more for 20 minutes. Use this recipe to make low-carb and veggie filled bread sticks. You can use this recipe to make a pizza crust also. 1 cup riced cauliflower You'll cook this after you process in the food processor. The best way to rice the cauliflower is to cut it up into small chunks. Next, process them in the food processor until it starts to really look like rice. Just make sure not to process it into mush. Next, microwave microwave in a bowl for 5-8 minutes, until it's soft almost like dough. Don't add water here; the cauliflower holds enough water on it's own. Preheat oven to 450 degrees. Grease your baking sheet with olive oil or cooking spray. Place cooked cauliflower in a fine, mesh strainer to drain as much as possible. You can press out the water in this step also. Take the drained cauliflower and put it ina clean dish towel and wrap it up! Here you'll squeeze until you get all the excess water out, or as much as you can. You really want to make sure you get as much water out as possible or it'll be too soggy when cooked. In a large bowl, combine the cauliflower, egg, and parmesan. Once that's nice and mixed you can in your salt, Italian season and minced garlic. Mix it up until it's all one mix mixture. Place your dough on the greased pan a roll out into a square size. About 8 x 8. You can then brush with some olive oil and top with a little parmesan cheese, if you want. Bake for 15 minutes. If it comes out too soggy, you can bake for an additional 15 minutes until it take on a more bread like consistency. You can also broil for some nice brown on top. Cut into bread stick sized pieces and enjoy! NOTES: One large head of cauliflower will make about 3 cups of riced cauliflower. Use immediately or store in fridge for up to 3 days.